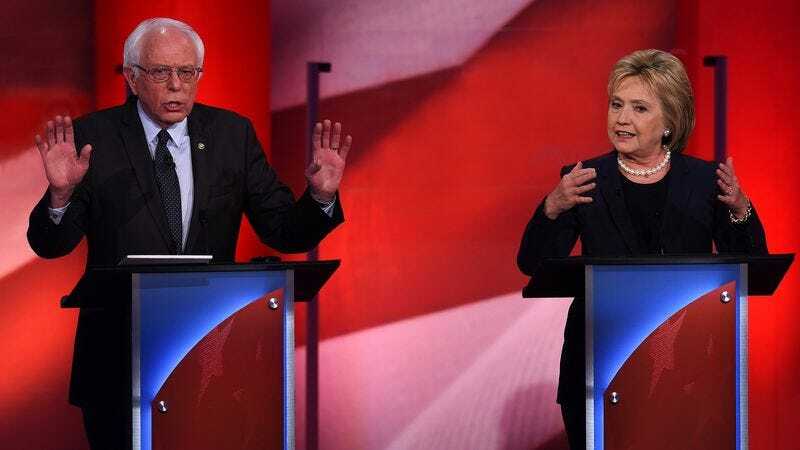 MILWAUKEE—After introducing the two candidates onto the stage at the University of Wisconsin–Milwaukee, the moderators of Thursday night’s PBS-hosted Democratic debate reportedly spent the first 10 minutes of the forum asking both Hillary Clinton and Bernie Sanders for advice on fundraising. “Senator Sanders, you raised $6.5 million in the 24 hours after winning the New Hampshire primary this week, while Secretary Clinton, you have amassed over $150 million in donations to date; my first question to both of you is: How did you do that?” said PBS NewsHour anchor Gwen Ifill, before following up with a more pointed series of questions about how often each campaign cold-called prospective donors and what specific donation pitches were used in each candidate’s most successful fundraising emails. “We ask that you clearly articulate what kind of merchandising you do. Do you make a lot selling shirts and bumper stickers, or is it mostly just straight donations? And what about membership levels?” At press time, Ifill was asking each candidate to turn directly toward the camera and clearly say the phrase “Your generous contribution will ensure PBS continues to educate, inform, and inspire” into their lectern’s microphone.